Manos Small World enjoys a quiet location on the edge of the caldera, has a panoramic terrace with a hot tub and offers elegant suites with direct views of the sea and the caldera. 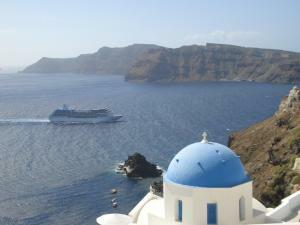 It is located at 5 minutes walk from Fira. Guests must show a valid ID and credit card upon check-in. Please note that all special requests are subject to availability and may incur additional charges. 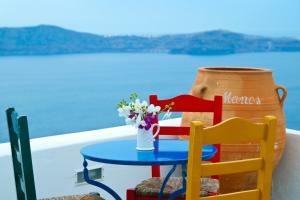 Suite with direct views of the Aegean Sea, the caldera, the volcanic island and the sunset. It has a maximum capacity of 2 guests. 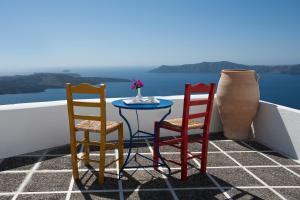 The superior suite is spacious and offers stunning views of the famous sunset and the caldera. It has a maximum capacity of 3 guests, children included. 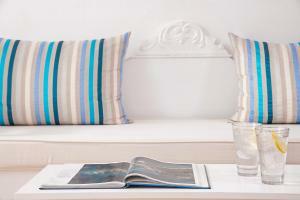 Family suite with direct views of the sea and the caldera. It has a maximum capacity of 2 adults and 2 children.